Posted on Thu, Dec 29, 2011 : 5:58 a.m.
Christmas is over, but my gift bag isn't empty. The Big Ten portion of the 2011-12 basketball schedule officially got under way this week, wrapping up the November-December run of holiday tournaments and meaningless non-league games. Even so, as the real fun begins, here's a look back at some notable and not-so-notable performers from the non-league slate. Michigan State senior Draymond Green, center, is a B1G Notes preseason co-MVP. Ohio State's Jared Sullinger (even hurt) remains the best player in the league, let's just get that out of the way. But during the non-conference portion of the schedule, no two players meant more to their respective clubs than Zeller and Green. The addition of Zeller seems to have changed everything in Bloomington, both physically and mentally. The 6-foot-11 freshman appears more advanced than his older brother Tyler (a North Carolina senior). He scores (15.1 ppg), he rebounds (7.3 per game), he defends (20 blocks, 25 steals) and his presence creates room for shooters (IU was shooting 51.4 percent as a team as of Tuesday). Beyond the numbers, he seems to have infused a confidence level into Indiana that's been missing. With a blue-chip piece in the middle, Indiana is good, and the Hoosiers know it. As for Green, he's basically done everything but drive the team bus and cook the postgame meal. Tom Izzo has compared his leadership skills to Magic Johnson, and on the court, he entered the week as the league's leading rebounder (9.8 per game) to go along with 15.5 points and 3.5 assists per game. The senior forward appears to be in the best shape of his career, and it's showing on the floor. He's been tremendous early, and he was instrumental in Michigan State's 11-game win-streak. No disrespect to Tom Crean, who has done a tremendous job inspiring Indiana's early success, but Smith gets the non-conference coaching nod for the disaster he averted. Minnesota lost All-Big Ten forward Trevor Mbakwe to a season-ending knee injury in the seventh game of the season. If losing one of the league's top players wasn't bad enough, things got worse for Smith, as 6-foot-11 center Ralph Sampson III missed the next two games due to a lingering ankle injury. Smith managed to rally his team together, getting contributions from a 10-man rotation to close out the non-league stretch on a six-game winning streak. Minnesota has a difficult road the rest of the way without Mbakwe, but it could be a lot worse. And Smith deserves credit for keeping things together early. Michigan freshman point guard Trey Burke (3). Folks in Ann Arbor figured he'd be good. But this good? Burke burst on the scene by out-dueling Memphis burners Joe Jackson and Will Barton in Maui, and hasn't let off the gas since. He likely won't match Darius Morris' assist numbers from a year ago, but his 13 points and five assists per game have been dynamite for John Beilein and staff. Burke's playing more than 33 minutes per game, and may hit a wall at some point, but so far, so good. Taylor entered his senior year as a preseason All-American. So far, he's come nowhere close to living up to that billing. Entering Big Ten play, Taylor's scoring average was down six points from a year ago (12.2 ppg) and his shooting percentage was 38.5 percent. Wisconsin fans shouldn't be too worried. Taylor's assist numbers were slightly improved (5 per game), and he wasn't named to an early All-America list for nothing. He's good, and he'll likely rebound. 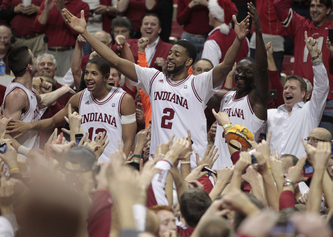 Indiana players celebrate their upset of No. 1-ranked Kentucky earlier this season. A return to prominence if ever there were one, Christian Watford's buzzer-beating 3-pointer seemed destined to fall through from the moment it left his hands. Almost like the basketball gods willed it to be so, Indiana's back -- and the first signature win of Crean's tenure in Bloomington seemed to prove it. Penn State is rebuilding. But this was ridiculous. The Nittany Lions went 3-for-23 from 3-point range, 16-for-26 from the foul line and leading scorer Tim Frazier shot 0-for-12 from the floor in an embarrassing four-point home loss to the Leopards, who hail from the Patriot League. There will be better days for Patrick Chambers in Happy Valley, but this was ugly. Ohio State big man Jared Sullinger returned to the lineup last week, and he looked just fine. Sullinger posted a double-double (18 points, 11 rebounds) in a 20-point victory over Lamar, and was able to get some rest with an 11-point, six-rebound effort in 24 minutes of action against Miami-Ohio. The Buckeyes have won 33 straight home games, have their centerpiece back in full health and now have all the makings of a legit national title contender. The Nittany Lions just can't muster any help for do-it-all guard Tim Frazier. The 6-foot-1 Frazier continued to do everything for Penn State in a narrow win over Cornell last week, racking up 17 points, 11 rebounds and six assists. But he's a one-man gang. And making matters worse, the rebuilding Nittany Lions begin Big Ten play with a pair of road games at Michigan and at Northwestern. The 6-foot-9 Smotrycz is simply refusing to miss 3-point shots. Smotrycz posted his second double-double in a row last week with a 20-point, 10-rebound effort against Bradley. But more impressively, he once again was brilliant from behind the 3-point arc. Smotrycz went 5-for-7 from deep against Bradley, and is 15-for-19 from 3-point range in his last four games. Number of Big Ten teams with 10 or more wins entering the first week of league play, more than any other conference as of Tuesday. Indiana's average margin of victory through 12 non-conference games. Steals per game by Michigan entering the week, worst in the Big Ten. Consecutive free throws made by Indiana point guard Jordan Hulls, a Big Ten record. 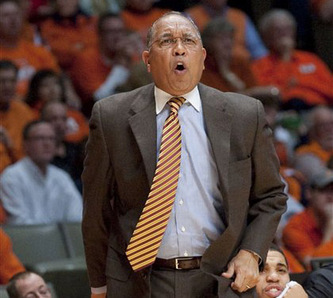 Hulls' streak was snapped against UMBC last Thursday. "I've been doing this my whole life. I'm so focused on the game, my mother could be on the other bench, my late mother -- bless her heart. And you know what, she'd be the same way." of his son, Patrick, on the opposing bench against Bradley last week. Two general requirements for an effective basketball halftime show are as follows: must be flashy, must be a bit creepy. Last Thursday at the Crisler Center, Michigan and Bradley basketball fans were entertained by the infamous "ZOOperstars." With a roster full of somewhat frightening inflatable animals named after sports icons, the ZOOperstars fulfilled both requirements. From Mia Hammster to Clammy Sosa, the ZOOperstars were flashy, and incredibly creepy. The team MVP, though, was undoubtedly Mackerel Jordan, a 7-foot-3 fish with an oversized tongue and massive mouth. Jordan's piece de resistance was his ability to eat a fully-clothed human before eventually spitting the individual back out. Fans didn't know whether to clap or to cry. Congratulations, ZOOperstars. You're a halftime show I'll never forget.